Public Hearing – Planning Commission – Tuesday March 13th after 1:30pm. An expansive fitness center/spa complex by the old tennis courts is being proposed 2-years after the CocoPalms re-build was approved. This parcel is between the historic coconut grove and the Wailua drainage canal and it’s zoned Open. Historically, it is part of a culturally significant and sacred area. It is also in a flood plain & in the Special Management Area which has environmental constraints. · leave the land open; allow unencumbered views and minimize further drainage impacts from development. CocoPalms is offering the county a gift of 15 acres of wetlands, mauka of the drainage canal in the conservation distraction for cultural use. BUT, they have a poor track record. They are “selling” the same bill of goods twice to the county -- land was promised 2-years ago at the negotiations table. · the sales showroom, website & marketing materials promote the fitness complex as if it is already approved, but the public hearing is still open. Kauai needs managed, responsible development, appropriate land use, and sensitivity to important cultural sites and environmental constraints. Please insist that the developer and Commission follow the intent of the laws and not make exceptions. The Planning Commission public hearing is March 13th at 1:30 pm @ Lihu'e Civic Center, Moikeha Building, Meeting Rooms 2A-2B. Or, write your concerns to the Planning Commission 4444 Rice Street, Lihu'e 96766. FAXES can be sent to: 241-6699. 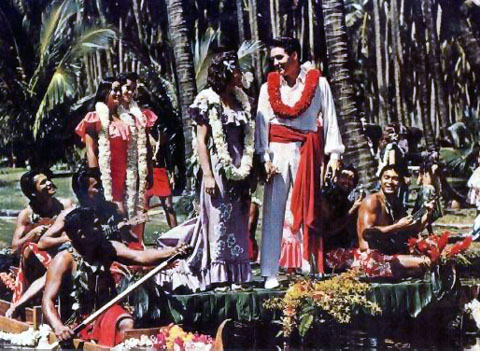 In "Blue Hawaii", in 1961, Elvis is married in the lagoon of the old Coco Palms. Kitsch is still alive. Whether Coco Palms Ventures has done its homework for a proposed multi-million dollar spa at the new Coco Palms resort in Wailua has triggered the scrutiny of the Kaua‘i County Planning Department. A county official said a report from the developer fails to go into details on plans to use 14,000 cubic yards of debris from the demolition of the old hotel to elevate the land for the spa. Coco Palms is proposing the work to protect buildings in an area that could flood. The official, who asked not to be identified, also said the report fails to go into any details over whether the project would have adverse visual impacts. The questions county planners are trying to find answers to could delay the much-awaited rebirth of the old Coco Palms in Wailua, once the flagship hotel for Polynesian hospitality in Hawai‘i in the 1950s and 1960s. With the commission’s approval of the overall resort project in recent years, the developer hopes to recreate the same feel of the old hotel through a reconstructed and but newly designed hotel. The proposed spa project came under attack by some critics at last Tuesday’s planning commission meeting at the Lihu‘e Civic Center. Securing the information on these issues is of high priority to planning department. Without it, the department cannot provide an informed analysis the commission needs to have for its own review before rendering a decision on permits sought by Coco Palms. Attempts to reach Rodney Funakoshi, a representative for Coco Palms Ventures, to respond to county concerns were not successful. The developer is seeking a Special Management Area Use permit, a use permit, a variance permit and a Class IV permit for the fitness center complex. Plans call for the center to be built on existing tennis courts in the northeast corner of the resort. The center would include an entry pavilion and reception area, locker rooms, lounge, gym, weight room, a lap pool with deck, plunge pools and two tennis courts. In its report to county planning department and commission, the developer refers briefly to the elevation of the land for the spa, but never said outright it wanted to use 14,000 cubic yards of demolition debris for the work, the county official said. Kane Pa, a Hawaiian sovereignty advocate who works in construction, said at a past commission meeting that the proposed work might inflict long-term environmental harm. The official said Pa stated lime in the debris could percolate underground, make its way to the ocean and damage marine life. “The fill concept was never presented to the (state Department of Land and Natural Resources), the Kaua‘i Burial Council or the Kaua‘i County Historic Preservation Review Commission,” the official said. All three entities have jurisdiction over the proposed work. Government watchdog Rayne Regush voiced similar concerns in an e-mail to The Garden Island. “I am concerned, as the Planning Commission should be, that the 16-feet of vertical fill is required to raise the proposed buildings to meet flood plain requirements,” she said in the e-mail. She also questioned whether asbestos was present in the 50-year-old buildings. The planning department is reviewing her concerns. The county official also said the state Department of Health would probably review the proposed work as well if contaminated demolition materials are used for fill. The proposal to put the spa on existing tennis courts is new, the official said. When the commission approved the rebuilding of the Coco Palms, the developer proposed to put the spa within the resort’s core, not on its periphery, the official said. Regush contended Coco Palms’ spa plan “is excessive” and cautioned the proposed project would be placed near historically and environmentally sensitive areas. “How ludicrous that adjacent to these elevated buildings they will be excavating a lap pool, despite oral histories stating there are burials near the tennis area,” Regush said in her e-mail. The county official said the Planning Department also will examine the appropriateness of dumping fill on or near cultural sites or using parts of the resort to hold construction debris. It is because of the concerns of unearthing burials or damaging the environment that the developer is seeking county permits for the spa. Regush also seemed to say the commission’s approval of the entire resort make it three-times larger than the original resort, and she didn’t like it. The county official said the Planning Department won’t know whether her assessment has any validity until it has reviewed detailed resort plans. Regush also contended the developer failed to petition the state to include fishponds in the Hawai‘i Register of Historic Places and revised plans for a cultural center residents wanted by the tennis courts. Coco Palms Ventures manger Richard Weiser had proposed to place historically sensitive areas, not necessarily any by the tennis courts, on the state register. 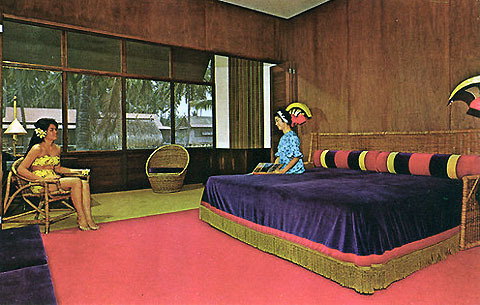 And at the same time, native Hawaiians and others had spoken of having a cultural center in the southern portion of the resort.